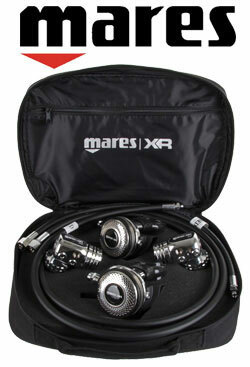 DR 25X set from Mares is a new designed regulator set, specifically for Twinset configurations. The 1st stages are fixed left and right sided, solid, compact and incorporate a vented heat sync design, improving cold water diving performance. A Unique port design, which angles the hoses downward, this allows for perfect routing and easy access to cylinder valves. The 2nd stages are all metal, compact and rugged, designed with a mess cover to disperse water around the diaphragm. Suitable for cold water, deep and wreck diving.